When you travel what are some of the requirements of your destination? We are a family and all have different likes and dislikes. We went to the Extended Stay America in Asheville NC last night and had such an amazing time. I could not get over the facility and all of the perks. This place has everything that we could ask for. Starting from the check in all the way to check out, we were completely impressed. 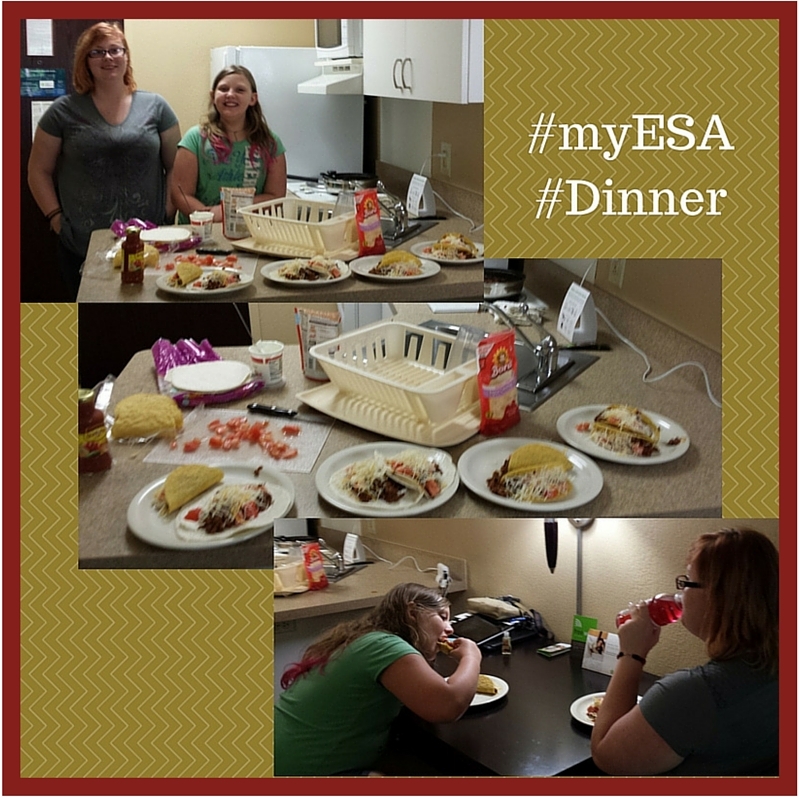 Starting with the 2 day stay, we were so excited to be able to do the review. It has been the talk of the house for the past week. Then the day of we were supposed to leave, the car rental pace didn't have our van ready. The only vehicles they had available didn't have enough seating for us. So I had to call and postpone our arrival time and it was OK!There was only positive vibes and nearly an eagerness sound to the clerk saying "We will see you tomorrow" I could hear her smiling. It was amazing to me. I don't know why but, even with that phone call being so upbeat, I still wasn't expecting the service we received when we did arrive. These guys are SO NICE! When we checked in ~ the whole process couldn't have been more than 5 minutes. They pulled up my reservation, activated our keys, thanked us for staying with them and offered any help to questions we might have I honestly have had less warm greetings from family and friends! I love the family feeling to the place. I was 110% comfortable as soon as we pulled in. The lobby is so nice. The colors are warm and inviting, not white and plain. There are 2 very comfortable chairs, a center table with a pretty lamp, and a coffee bar right there. Some people may not find that so amazing but, a place to sit that is not the vehicle is so nice. The big picture in the lobby said "Welcome". We felt welcome, it was so cool! To this point of our stay- still checking in- Aron said "I like this place", "I really like this place", and "Oh yeah, this place is so nice!". We were honestly that impressed. Moving on to the actual room where we were staying. We were on the first floor. The have luggage carts at easy access for guests. We didn't have too much to get to the room but, it was still nice to not have to struggle. The hall ways are wide enough to maneuver comfortably with the cart and the room numbers were easy to find. When we first walked in, it was like looking at an apartment. The kitchen was the entrance, the bathroom immediately to the right, the table with chairs was right on the other side of the bar, there is a beautiful large dresser with a flat screen T.V. on it, the beds were to the right of the room, with a comfortable chair next to the windows ( that actually opened- a motel with fresh air!!!) and there is a closet to the far left with a full to floor curtain to put all of our luggage and coolers. 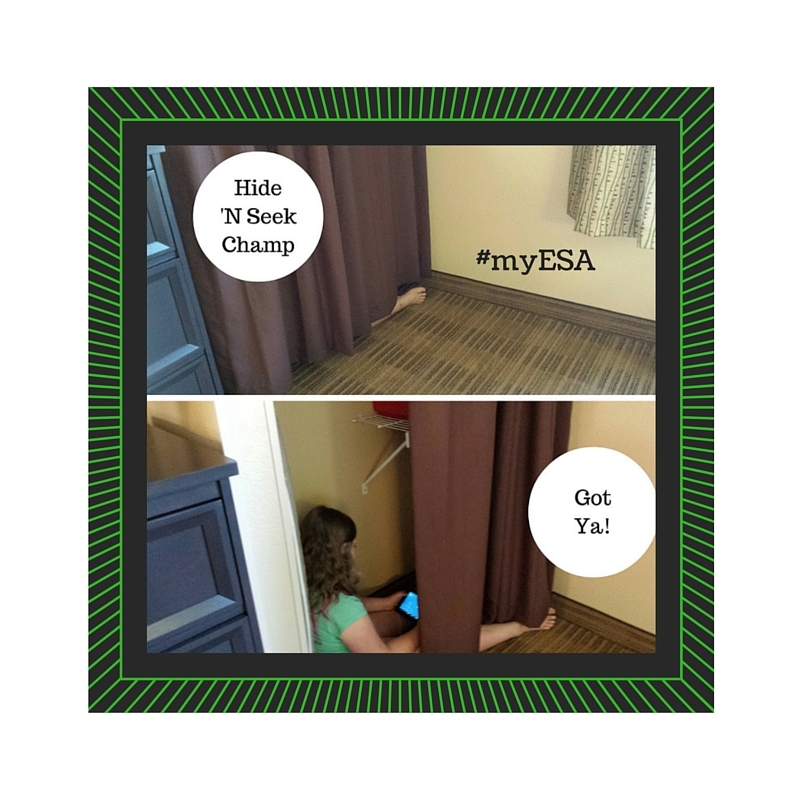 Extended Stay America went above and beyond any expectation we had. The personal touches were fabulous. On the big table there was a gift bag and a card with Groves on it. The thank you note was so nice and so personal. The general manager left her card and said if we needed anything to let her know. AND Thanked us again for staying. I felt like we were invited on a vacation for this stay! 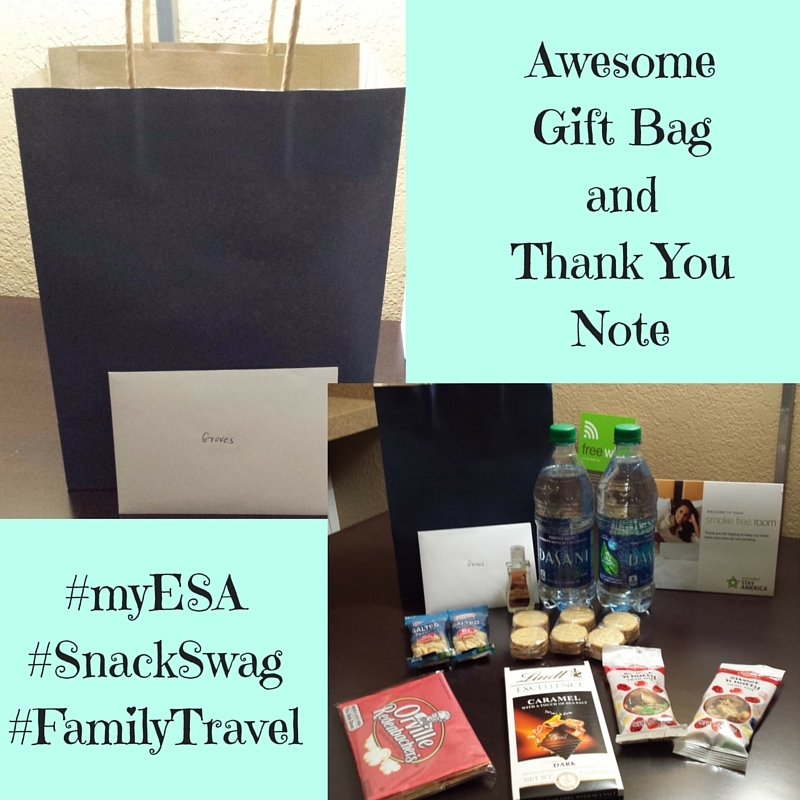 The gift bag had bottles of water, popcorn, snack packs of mixed nuts cookies and even hand sanitizer. That's perfect, even Aron can eat nuts and popcorn!! The fact that we can cook what we like just like were at home, being away from home, is a great option. That is for several reasons. For one, Aron is diabetic. We are used to cooking things that are leaner and without additives that affect his blood sugar. Going out to eat the only the options he has is eating bland, risking a spike or even worse; still being hungry. No one likes that. The kitchen has a full size refrigerator, stove, sink, microwave, a large counter top to actually work on and so much cabinet space, There were cabinets for food, dishes, pans, and even a garbage can under the sink. 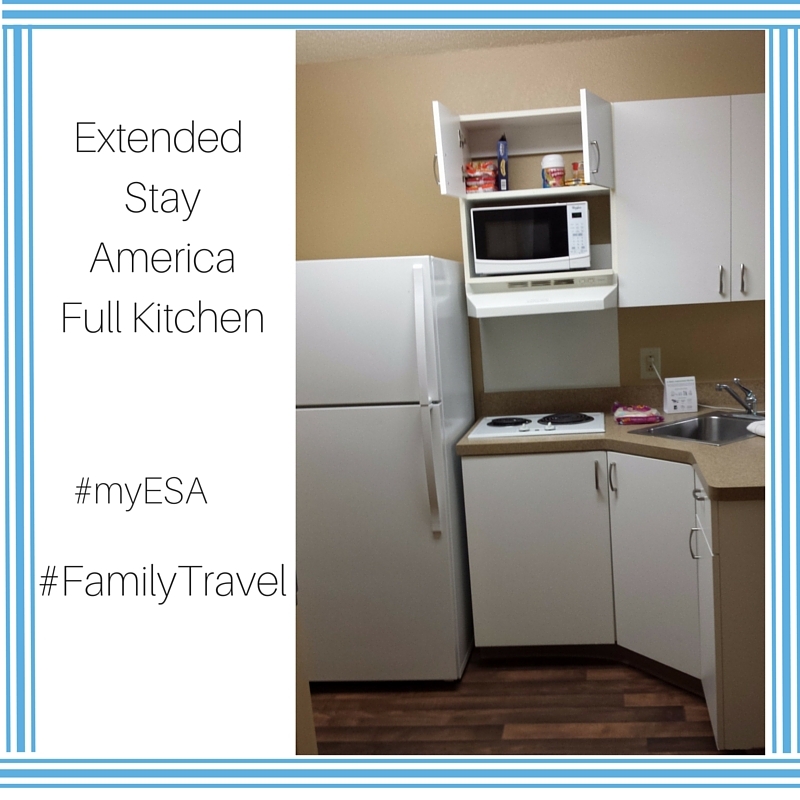 Extended Stay America offers such amazing options. We were able to travel cheaper by bringing food with us to the room. We made tacos last night. They gave us pans, cutting board, a real cutlery set, spatula, colander, dish rack, service for 4 with large plates, small plates, bowls, cups, and even coffee mugs. They have toasters and coffee pots as well! The bonus to all of it, they even have dish soap packs. We didn't have to bring anything except our own food! After we got settled in we ran down to the grocery store grabbed the fresh items we needed and were able to go back and relax. The kids hooked up their devices and chilled out while I cooked and it was so nice to see my family relaxed and enjoying the quiet away from the hustle and bustle of our every day lives. We had such a nice night relaxing. The whole place had such a nice feel to it. The pictures throughout were just so nice. There were so many images of red doors. I thought that was so fitting since by American standards, a red door symbolizes a safe place for travelers. I looked into it a little more because I was curious and really liked it, what else does it mean. I found a a website named American Red Door that explained it better and made me understand it even more. It drew me even closer to the art in the establishment. In early American tradition, a red door symbolized to tired horse and buggy travelers that a home was a safe place to rest and stay. During the civil war, “safe homes” that were part of the Underground Railroad supposedly painted their doors red to guide escaped slaves to places of refuge and safety. Scottish tradition holds that homeowners paint their front door red to signify that they had paid off their mortgage. Chinese consider red to be a lucky color and therefore many Chinese put a fresh coat of red paint on their front doors as part of their New Year celebration. The principles of Feng Shui state that bold colors invite positive energy and that bold colors like red invite opportunities and abundance. Although many claim Albert Einstein to be one of the most brilliant minds ever, he had his blind spots. Apparently, Einstein painted his front door red because he couldn’t remember which house was his without the red door. This whole stay was absolutely amazing. Like all of the things that I have mentioned aren't enough, there is more. This place even has a full laundry area with vending machines so, if we have the late night snackers, we are ready to go. With traveling with the family, it's so nice to be able to have clean laundry. Spills and messes happen. Life is messy, being able to keep up with it away from home is so nice. These guys are perfect for the long stays. They have weekly and monthly rates. 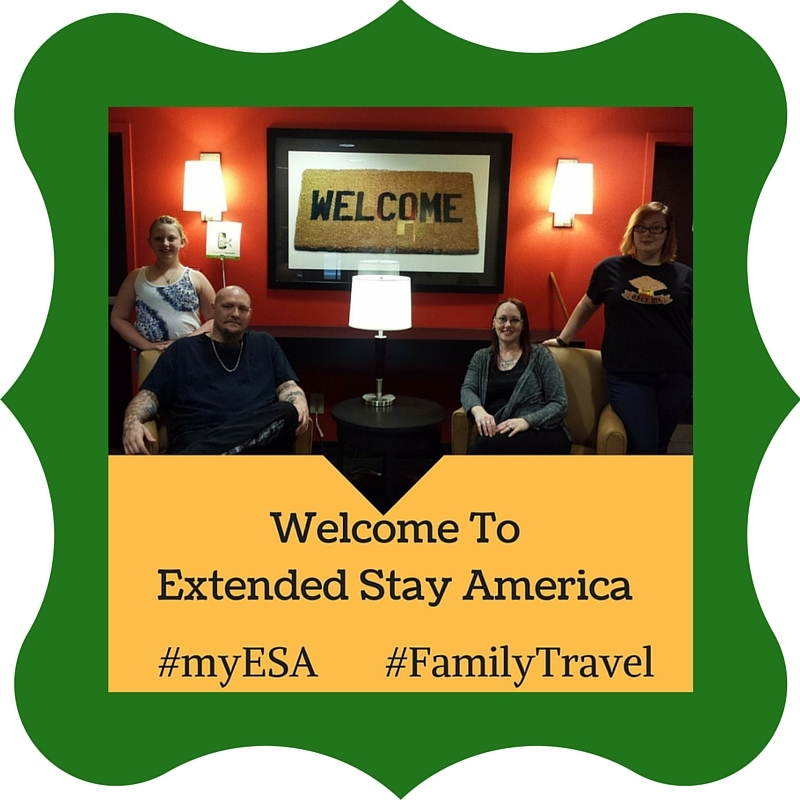 Thanks so much Extended Stays America for inviting our family to stay with you and enjoy your beautiful motel. We were completely impressed with the entire package! A great offer for you and your family. MG6AA Offer: 20% off 1-14 nights Book dates: 7/1-7/31 Check out: 20% off 1-14 nights offer good for one reservation booked on ExtendedStayAmerica.com, with a check-out date on or before Discount applied at hotel upon check-out. Reservations based on availability. Offer cannot be combined with any other offer or negotiated or special rate, including but not limited to Advanced Purchase. Valid only on original reservations. Discounts do not apply to extensions/modifications. Cannot be applied to reservations already booked. Only one promotion discount per thirty days can be used by the same guest at the same hotel location. Offer valid only at Extended Stay America hotels.